Reports are doing rounds that director A.R.Murugadoss may remake Spyder in Bollywood with Salman Khan in the lead role. Filmmaker A.R.Murugadoss’s latest release, Spyder, opened to a mixed response in Telugu and Tamil but the collections of the film have been quite steady. Starring Mahesh Babu in the role of an intelligence officer, Spyder is the biggest release in the career of Mahesh Babu and marks his debut in Tamil cinema. There were rumours doing rounds that Spyder may be remade in Bollywood and top star Salman Khan may feature in it. But filmmaker A.R. 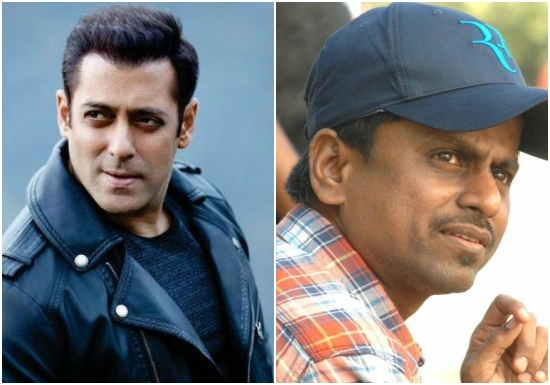 Murugadoss clarifies about the remake and his plans to feature Salman Khan in it. “Salman has a huge following in Andhra Pradesh too. They would be disappointed to see him doing something they’ve already seen another superstar do. No, I will make only an original film with Salman,” a report in DC quoted director A.R. Murugadoss. There were few reports doing rounds earlier that Mahesh Babu himself might feature in the Bollywood remake and make his debut in Hindi. However, these are unconfirmed reports. Spyder has received an overwhelming response in Tamil Nadu and was even praised by Super Star Rajinikanth after he watched a special screening of the film. “Film is very good. Film has good message along with superb action part. Murugadoss handled the subject very well. Mahesh Babu gave an extra ordinary performance. I congratulate entire unit of ‘Spyder’ for delivering such a superb film,” Rajinikanth had said. The collections of Spyder on Day 1 were close to INR 50 crores which is a record for any film in South Indian cinema after Baahubali. What do u expect from Rickshaw-wala fans? Public already stopped Salman’s Tubelight. Salman is the real King Khan! Salman is the real Bhikaari. Always begging the court to allow him to escape from his crimes. And you are a beggar may not be earning more than 10k rupees a month! Salman is the Sultan of Bollywood! Salman is the CONVICT of Bollywood. And you are a Lawaris road side loafer! Salman Khan is the Emperor, he is a Superstar right from 1980’s. I respect Mahesh Babu as well, he is a great actor! But plz do not compare Salman Khan with him for God sake. Salman Khan doesnt need anybody’s help to deliver a blockbuster unlike SRK or Aamir who rely on actresses and glamour (former) and the later on a very well crafted script! One flop cannot make an actor a flop star! Semi Hit and above average arent flops! But as usual, if Salman Khan cannot deliver a 200 crore+ his film is considered a flop just coz people know he can deliver much much higher collections all alone! Even Prem Ratan Dhan Payo when collected 209 crores was trolled as it dint reach 300 crores. But none of the other stars made it to 200 crore that year other than Salman with one 300 crore movie in the form of Bajrangi Bhaijaan. Like that SRK has given a string of flops these days in the form of Fan, Dear Zindagi, Dilwale, Jab Harry met Sejal etc and Amir with Dhobhi Ghat and Talaash! Akshay a lot more but yes nowadays hes really doing good! Same with all other north and south superstars. So the fact is fact! Real star power is when you have more than one releases a year and you deliver 200+ or 300+ crore grossers or atleast blockbusters or superhits and not starring in one film in two years, getting the best festive slot with 3 to 4 weeks free run and giving an all time blockbuster! The real test comes when frequency of release is taken into account and such tests are only passed by Salman Khan and now Akshay Kumar, SRK has done it earlier, he might in future but for now its all dull for him. And you got nothing trolling Salman Khan! Go and get yourself a job, empty minded freak! Lol. This is so rich coming from Bhai’s jobless mavaali fans. Salman made his career out of remakes of South movies, particularly Mahesh babu’s films. Who is this moron commenting? I am Sohail Khan. Salman’s films made me a moron. No, we are anti-criminals like Salman. Salman made his career out of remakes of South movies, particularly Mahesh baby’s films. As if Salman fans have any job or any life of their own. IRONY. You Fool! Go get a life! Go to work jobless fellow, burden on Indian GDP!!! Salman’s fans are the biggest burden on Indian GDP! They have no work, no life. All they do is abuse and bully others because it makes them feel better about their miserable life. So rich coming from the fan of the criminal who won’t ever have a wife to handle his crimes. Abe ooooh saale! Kudh kuch kartha nahin, yahaan kya comment kartha hai be agar tu Salman ka fan nahin hain toh? Haan hain hum salman khan fam, fakar se kehte hain aur support bhi karthe hai. Tujhe kya kujli hai agar usne shaadi nahin ki? Stop your nonsense man! If you are a fan of some other actor! Go and comment there but dont bad mouth here! Simply dont get into exchange of bad words! Salman and Modi are birds of the same feathers. That’s why they fly kites together. Same for Bhai and blind Bhaitards. Did you mean to support Modi?